Posted under Health Guides. Updated 6 February 2019. Trichotillomania is also called the “hair pulling disorder” and it is considered a “body-focused repetitive behavior”. People who are diagnosed with trichotillomania may also have anxiety and depression. It’s not easy to stop hair pulling but with treatment it is possible. Trichotillomania sounds like a made-up word but is a very real condition that involves an uncontrollable urge to pull one’s hair out. People who have this disorder often feel embarrassed and ashamed because they can’t control their behavior. Trichotillomania, pronounced: “Trick-oh-till-oh-main-e-ah” is also called the “hair pulling disorder”. Hair is typically pulled by single strands or in clumps from the head, eyelashes, eyebrows, arms, legs, and/or pubic area causing patches of missing hair. Some people are aware of their behavior while others don’t realize they are doing it. Trichotillomania is not just a bad habit, it is a serious condition, also called “body-focused repetitive behavior” that is often compared to obsessive-compulsive disorder (OCD). Most people who suffer from trichotillomania don’t know why they pull their hair out and want to stop on their own, but they can’t. Anyone can get trichotillomania-both girls and guys can have it at any age but it usually starts during puberty. Researchers don’t know the exact cause of trichotillomania. It is thought that it could be passed down in families, and hormonal and environmental factors including stress may play a role as well. Some people may begin pulling their hair out after a stressful event but it also can start for no apparent reason at all. What can happen to someone who has trichotillomania? While some people may describe their symptoms as mild, many people with trichotillomania feel badly about themselves and say that it is a source of severe emotional distress which can cause anxiety and depression. Having trichotillomania can interfere with family relationships, friendships, school, work, etc. Without treatment chronic hair pulling can lead to possible skin infections and scarring. If a person eats their hair (trichophagia), it can cause stomach problems. What is the treatment for trichotillomania? Treatment varies but usually involves taking medicine and meeting with a therapist who has experience treating people with trichotillomania. 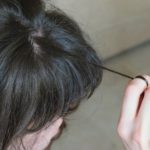 What should I do if I think I have (or a friend has) trichotillomania? The first thing you should do is tell your parent(s) or trusted adult about your concerns and then make an appointment with your primary care provider. If you find out you have trichotillomania, learn as much as you can about it. You’ll also need the help and understanding of your parent(s) or trusted adult, siblings, and friends. Once you have connected with a professional who has experience working with patients who have trichotillomania, ask about all the treatment options. Many people who are diagnosed with trichotillomania can learn to control their behavior with both medication and counseling including interventions such as cognitive behavior (CBT). Since not everyone’s symptoms are exactly the same, treatment should be individualized, with your specific symptoms and lifestyle in mind. Are there any resources that provide education and support? Yes. Many people who are diagnosed with trichotillomania benefit from learning about their condition, talking and/or meeting others who have it and attending events that provide education and support. An example of how to ask your health care provider for help is: “Could you give me information about trichotillomania and help me find a support group? I have trichotillomania and I pull my hair all the time without even thinking about it. My mom gets frustrated about it but I tell her I cannot help it. Any advice on how to stop my hair pulling?